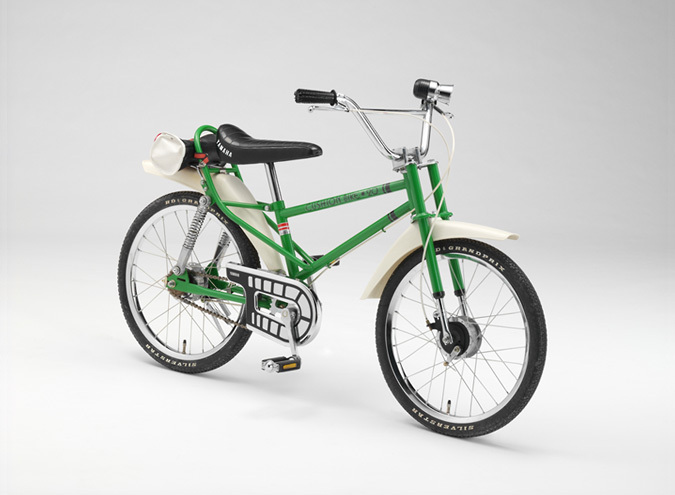 1976 Cushion Bike 20 - Communication Plaza | Yamaha Motor Co., Ltd. Following the MB1 and MB2 motocross bikes targeting junior high school students and younger, this was a sport bicycle targeted toward elementary school students. As the name suggests, both the front and the rear wheels are fitted with suspensions. Featuring a design just like a trail bike and an abundant array of features such as 20 × 1.75 inch tires, front/rear drum brakes, and bridged-type handle bars, this became a dream bike for children. Tire: 20 × 1.75 in.